That beautiful Revenge Chair. How could it be? How can a chair that beautiful be destroyed? Who killed the Revenge Chair? Lydia Davis is a cruel woman. She used her guile to worm her way back into Conrad Grayson’s bed and inserted herself right in the middle of Victoria’s life – taking her place on Victoria’s Throne. But how and why destroy that beautiful Revenge Chair? That is exactly what happened in Series 3, Episode 11 of Revenge. Lydia demonstrates her disgust at Victoria’s rule of the social scene and Conrad’s life as she empties a glass of red wine all over the seat of that beautiful piece of furniture. Victoria’s Throne, that beautiful chair that makes us dream of far-away places, is forever disfigured. The Revenge Chair in the lounge room of Grayson Manor, will never be the same again! Fans of the Revenge chair were shocked. Maybe even more shocked than when we found out Charlotte and Emily are half sisters. Or even when we saw who shot Emily. 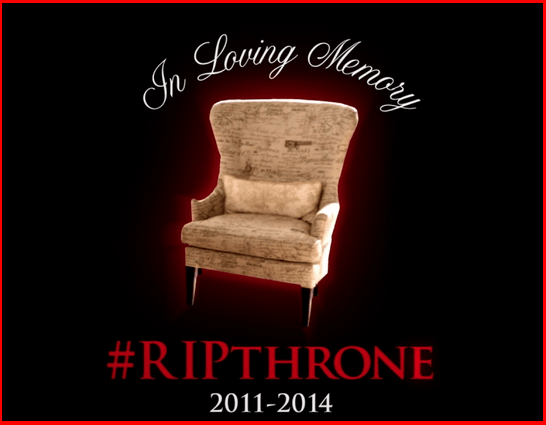 Fans took to Twitter and under the hashtag #ripthrone, expressed their shock and horror at the ill treatment of the beautiful chair. We all waited keenly to see what Victoria will choose to replace her throne with. As we expected, the new throne is beautiful. But we will always miss our favourite Revenge Chair. Because here at Leisure Lounges we manufacture custom made lounges to suit any occasion, you can now order your very own custom made Revenge Chair. Looking exactly like the chair in the TV series, you will feel as good as Victoria did while sitting in that beautiful chair. Don’t wait a minute longer. Contact Leisure Lounges now to order your own Revenge Chair and get the best deal in town.